Cloud Cover Music can reduce perceived wait times, maximize table turnover, and improve overall customer satisfaction. Try us for free for 14 days! You Give Us the Business Goal, We’ll Point You to the Right Music! Cloud Cover Music offers an array of customized messaging and restaurant music solutions for all your QSR business needs. Lines are inevitable. Unhappy customers are not. 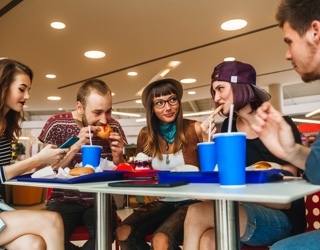 Overhead music has the power to shift customer attitudes, diminish perceived wait times, and even influence perceptions of food freshness. 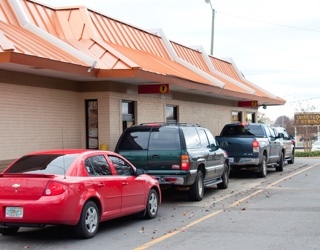 Drive-thrus account for more than 50% of fast food sales — make sure your outdoor lane experience is on point. Handpick music stations to make wait times more enjoyable or create promotional messages to advertise new menu items, impulse purchases, and limited-time offers. 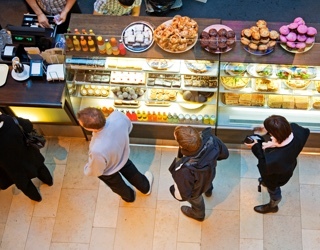 Moving more customers in and out the door quickly is crucial — especially in fast-paced QSR environments. Our customizable music solutions can lead to faster table turnover and increased revenue. The happier your staff, the happier your customers. Liven up the break room and back-of-house. Empower employees by allowing them to suggest their favorite Cloud Cover Music stations. Studies show that music can help improve mood and focus in the workplace. Whether your employees are prepping food or restocking the storage room, keep them continuously engaged with over 100 hand-crafted stations… Think productivity, workman’s comp, premiums, and food freshness! In the restaurant industry, studies show that the right in-store music experience can affect how much customers order, and how quickly. So why not use this to your advantage? Whether you operate one location or dozens of quick-service restaurants, Cloud Cover Music can help you create the perfect branded soundtrack for your business. With our affordable monthly subscription, your QSR has access to over 100 fully-licensed music stations, free of explicit language and commercials. From tropical latin and smooth jazz to classic oldies and pop hits, we boast an eclectic selection of genres to meet your unique needs. Schedule music by time of day, remove unwanted songs, or utilize the promotional messaging feature to reinforce branding and increase add-on impulse purchases. In the service industry, a superior customer service experience can only be provided by happy employees. And guess what? Music and happiness go hand-in-hand! If you want to keep morale high, our comprehensive collection of music for restaurants has a station to match every listener’s personal style. If you’re ready to create an exceptional in-store experience that influences purchasing behavior, captures guest loyalty, and improves overall customer satisfaction, try Cloud Cover Music for free today! Get started and accelerate your QSR sales with music for business!